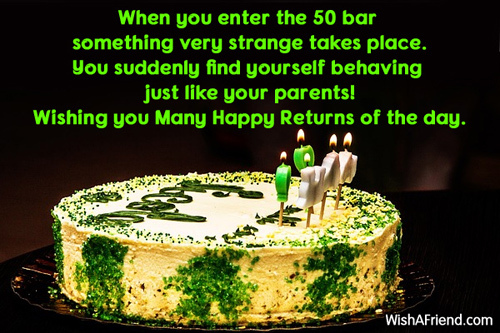 Wish to greet someone on their 50th birthday? 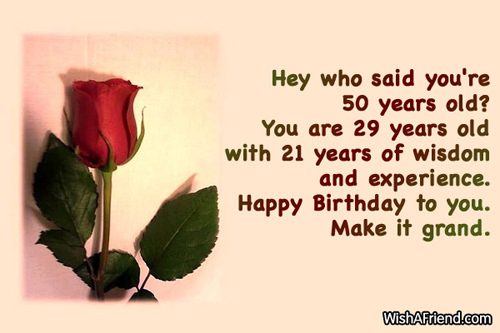 Find special 50th birthday wishes right here. 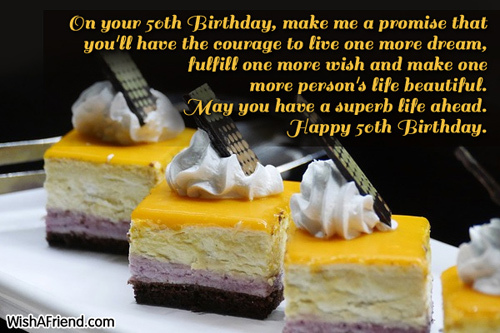 Share these 50th birthday wishes with your friends via Text/SMS, email, Facebook, Whatsapp, IM, etc. 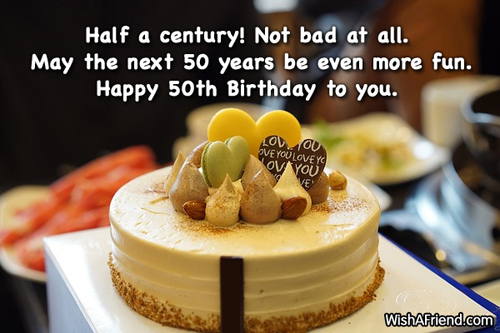 Half a century! Not bad at all. May the next 50 years be even more fun. Happy 50th Birthday to you. It is so hard to believe that you are 50 now. Especially because you look nevertheless like a 20-year old! 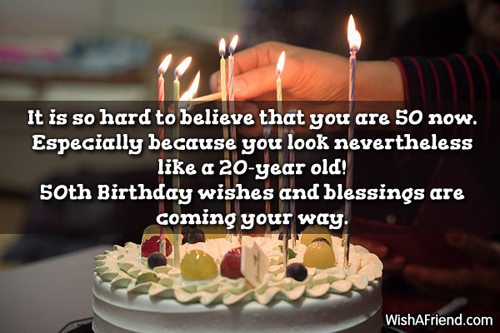 50th Birthday wishes and blessings are coming your way. Congratulations champion, you have made it through half a century of your life! I'm so proud of you. 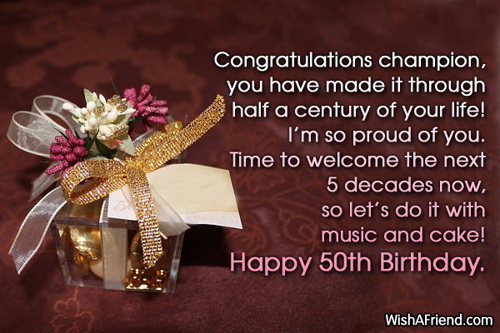 Time to welcome the next 5 decades now, so let's do it with music and cake! Happy 50th Birthday. 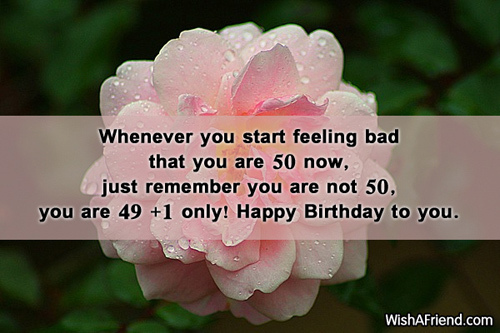 Whenever you start feeling bad that you are 50 now, just remember you are not 50, you are 49 +1 only! Happy Birthday to you. Why do you worry about growing older, when you are like wine just getting better and better with age? Happy 50th Birthday stunner! When you enter the 50 bar something very strange takes place. You suddenly find yourself behaving just like your parents! Wishing you Many Happy Returns of the day. Hey who said you're 50 years old? You are 29 years old with 21 years of wisdom and experience. Happy Birthday to you. Make it grand. 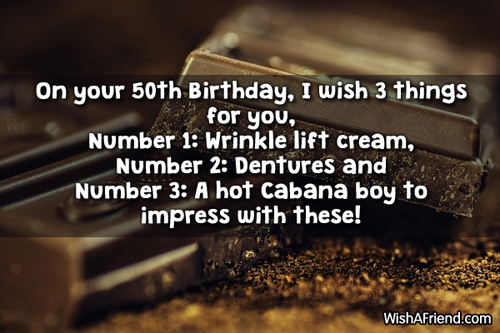 Number 1: Wrinkle lift cream, Number 2: Dentures and Number 3: A hot Cabana boy to impress with these! Since the first half of your life had been beautiful, the second half is going to be even more graceful. 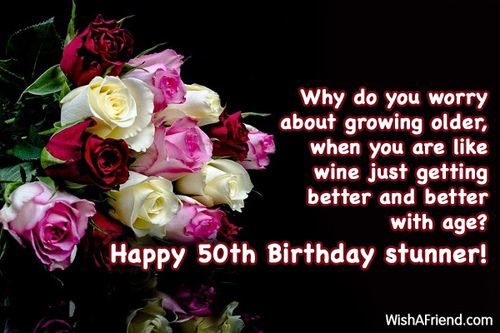 Wishing you a very Happy 50th Birthday. 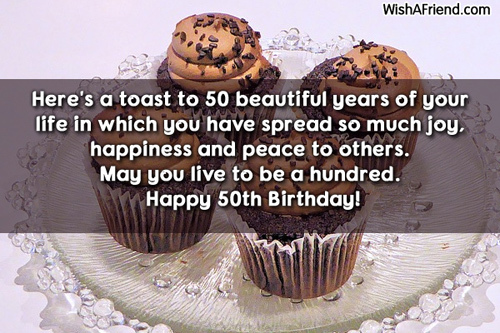 Here's a toast to 50 beautiful years of your life in which you have spread so much joy, happiness and peace to others. May you live to be a hundred. Happy 50th Birthday! In the midway of your journey, I urge you to pause, take a deep breath and see how far you've come. Do this and your second half of the journey will become painless. 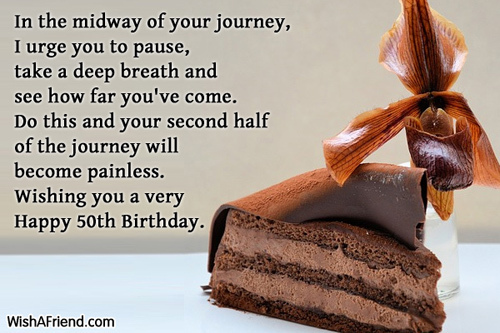 Wishing you a very Happy 50th Birthday. 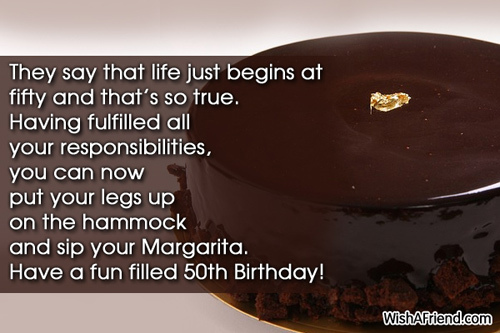 They say that life just begins at fifty and that's so true. Having fulfilled all your responsibilities, you can now put your legs up on the hammock and sip your Margarita. 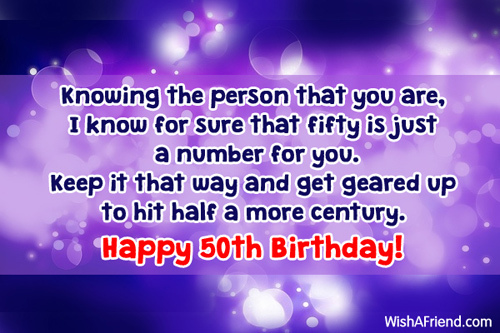 Have a fun filled 50th Birthday! At fifty, nothing should shock you or surprise you out of your wits. Since you've been-there-done-that, let everything amuse you. 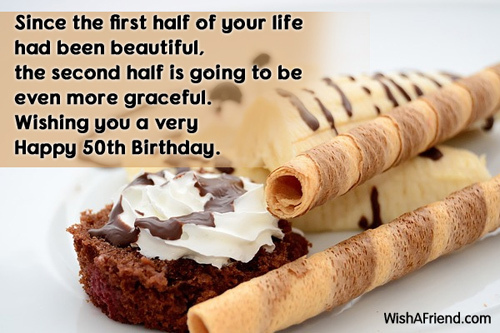 Happy half a century! 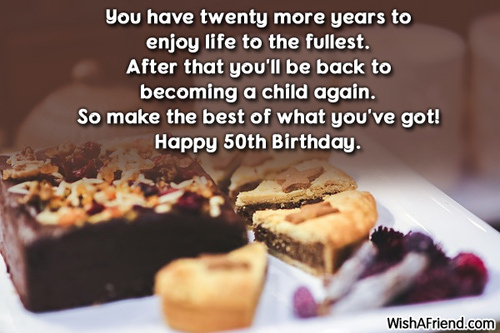 On your 50th Birthday, make me a promise that you'll have the courage to live one more dream, fulfill one more wish and make one more person's life beautiful. 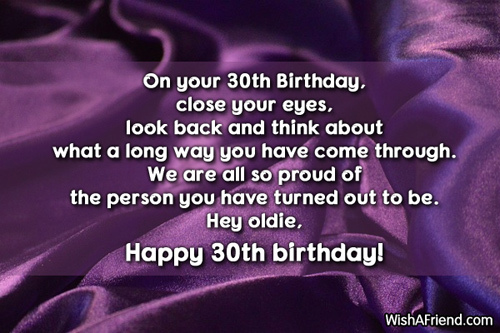 May you have a superb life ahead. Happy 50th Birthday. Being fifty may not give you an aura around your head but it will definitely give you love handles around your tummy. Haha. 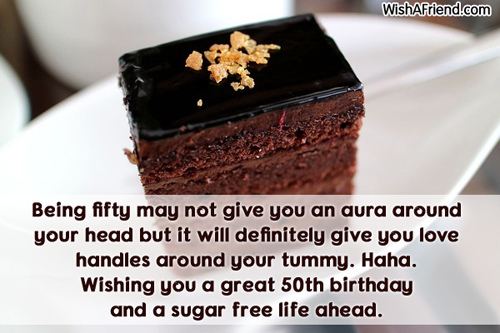 Wishing you a great 50th birthday and a sugar free life ahead. Knowing the person that you are, I know for sure that fifty is just a number for you. 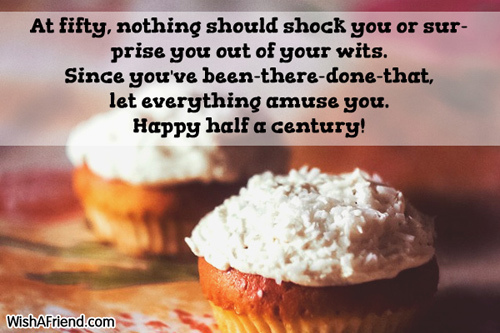 Keep it that way and get geared up to hit half a more century. Happy 50th Birthday! You have twenty more years to enjoy life to the fullest. After that you'll be back to becoming a child again. So make the best of what you've got! Happy 50th Birthday.